Big Green SwitchBlogSolarIs Solar Energy a Good Investment For My Business? Is Solar Energy a Good Investment For My Business? It’ll come as no surprise that businesses have been using solar energy for years and although we all know of the environmental benefits it can provide your commercial property with, there are many financial positives that factor into using solar energy as a business investment. The use of solar panels and PV energy to produce electricity offers you the chance to cut your electricity bills whilst getting peace of mind that you’re not contributing to the huge volume of greenhouse gases that are damaging our planet. Is my commercial building suitable for solar panels? It is a common concern for entrepreneurs to worry about the suitability of their building when looking to install solar panels but solar panels work by capturing the light energy – not the heat like many people think! 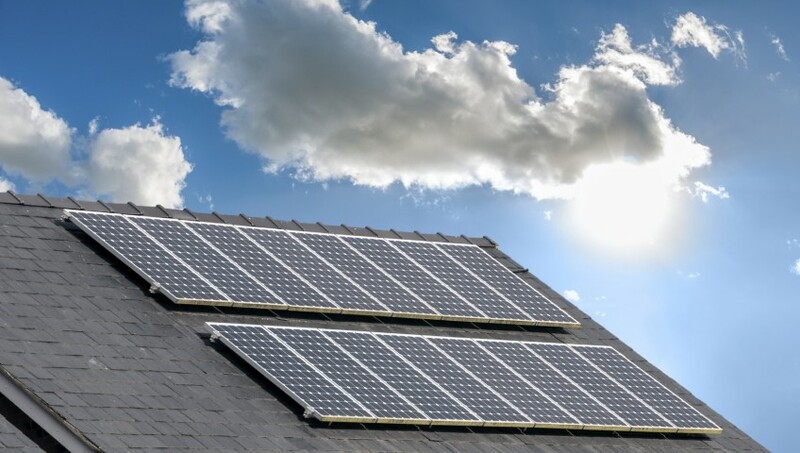 The ideal situation for solar panel installation is on a south-facing roof and ledged at around 30 degrees. However, the light energy will still be captured if the roof of your building is flat or facing another direction. That means whether your commercial property is located in a gloomy area that doesn’t feel the heat from the sun or is not angled, it’s still possible to generate a worthwhile amount of sustainable energy for your business to thrive on. Small businesses and startups can benefit greatly through solar panel installation when they enrol in the governments’ Feed-in Tariff scheme – a system that essentially pays you for using solar panels on the roof of your building. However, since cutting the feed-in tariff for small solar PV installations in the January of 2016, businesses using the scheme will only receive 4.39p per electricity generated – a massive 65% drop from the 12.92p offer previously in place. Payments given through this scheme is guaranteed for between 20-25 years. Larger businesses that use and create their own solar energy are also supported through the Renewables Obligation scheme. Certificates, called ROC, are given to large-scale electricity generators which entitles them to receive a premium in addition to the price they’re paying for wholesale electricity. Is using solar power less expensive than energy from utility companies? With the ever-lasting objective for businesses to reduce their energy bills becoming more and more difficult to achieve, the increasing cost that utility companies are charging for gas and electricity are driving more people towards renewable solar energy. Utility and power companies charge their products at prices dependant on the availability of the fuels. This means that as fossil fuels like coal, oil and gas become more difficult to get hold of, the cost of electricity supplied by your utility provider are bound to increase too. However, because solar energy is free once solar panels have been installed, the price of electricity generated through your generators is guaranteed not to rise once materials become difficult to get hold of. Not only that but it doesn’t cost a penny – it’s really a no-brainer! To find out more about how your business can invest in solar panels, get in touch with one of our energy experts. Let us help you make the Big Green Switch to affordable, sustainable and renewable electricity.